Join Ann Albers and her Heavenly Helpers as they guide you through a series of fun and playful exercises that will help you open up to channel your own guides, angels, relatives, and indeed all of life! You’ll play with whales, fairies, and inanimate objects. You’ll be guided to merge with your angels to feel their love, receive their guidance, and channel healing energy for others. Anyone can do this! Ann also shares her wisdom from years of working with angels so you can understand how they think and perceive life, how they work with you, and how they will guide you. If you understand the differences between human thought and angel wisdom, then you can partner with your angels to live an extraordinary life. Even if you weren’t able to attend in person you will receive the energy and the love from the live playshop as you listen to this CD set! Come Dance with Your Angels! Life may never be the same! 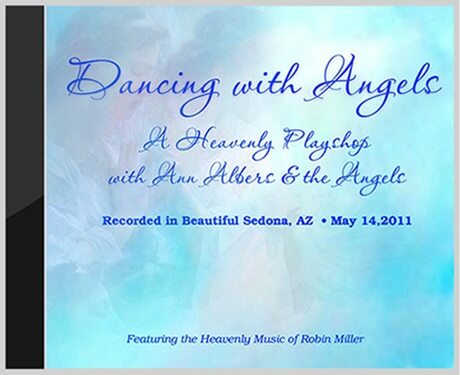 Featuring the Heavenly Music of Robin Miller. Used with Permission.